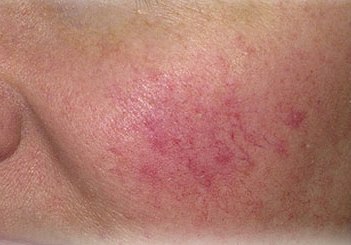 Rosacea is a condition that is sometimes called acne rosacea. It produces facial redness and breakouts. The most noticeable effects of rosacea on the skin are prominent blood vessels and large pores and a bumpy surface on the nose. In my office, we have excellent results treating the redness and the irregularities on the nose and cheeks with my Facial-Electro Resurfacing™. This procedure can be done at very mild to strong electrical intensities so that the number of treatments can be tailored to patients’ individual needs. The breakouts of rosacea can be reduced with appropriate medication. Related post: What Can be cone for large pores on the nose?